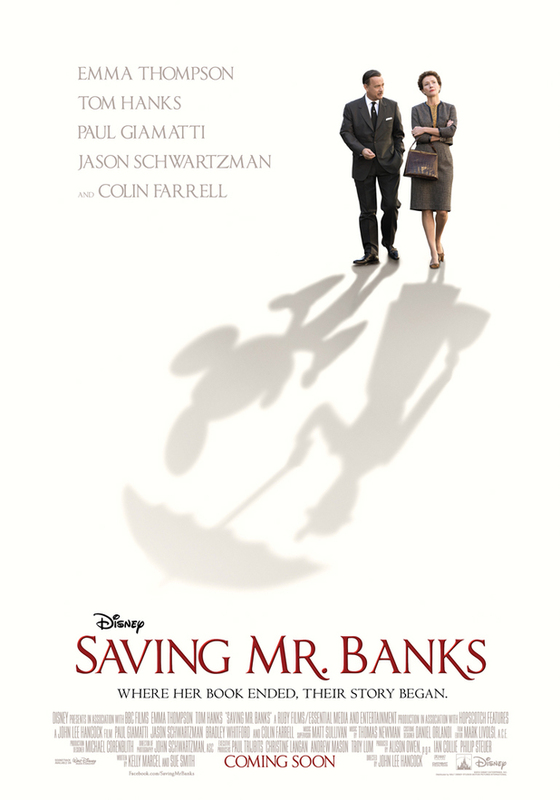 Saving Mr Banks is Practically Perfect in Every Way! Saving Mr Banks really is a good film. This film is unexpectedly sad in some ways. From what I knew of P.L.Travers or Helen Lyndon Goff (her real name) she didn’t exactly have the happiest of lives. Being that is made by Disney I thought there may have been a bit more a happy twist placed on this film. It just was not like that. It started with a Mary Poppins like quote read from a narrator with images of clouds in the sky. These clouds circled around towards the ground where we meet P.L.Travers as a child. She is there playing with her father – Travers Robert Goff. They were just about to leave their home in Maryborough, Queensland – 1905. We are then taken to London, England 1961 where we meet P.L.Travers as an adult arguing with her agent over visiting Walt Disney. The film has both her childhood and her time spent in Los Angeles interwoven with each other. This takes us into her life in a unique way while also allowing us to understand why she does not want to let go of these stories; of her Mary Poppins. They also manage to give us small glimpses of the movie Mary Poppins with music, photos and film. Which is done magnificently and in a variety of ways. Slowly as the film unfolds we can get a better idea about where Mary Poppins actually came from, why she was created. I do not believe from what I saw it is based on one particular person in her life but aspects of maybe two. For those of you who have not yet seen the film and plan to I am relucent to say too much. It makes writing this blog post rather difficult or slightly more challenging than usual. But I am still having fun reflecting on a movie that I know I will happily go back and watch again. Of course I will then buy the dvd. P.L.Travers and certainly Mary Poppins would not approve of such a thing. DVDs! I almost wish for both their sakes that this story had been presented in a more old-fashioned and more appropriate kind of way! But it does not stop me from loving it! Tom Hanks as Walt Disney and Emma Thompson as P.L. Travers were great casting choices. I could not have picked two people better suited for their roles. In the way they look and in how they speak! How they work off each other enables me to see how it might have been at the time. The costumes helped, too! If you plan on seeing this film, wait until almost the very end. You’ll be in for a nice surprise. Even if you do not love Mary Poppins as much as I do or any of her fans. This film needs to been seen! Happy Mother’s Day and the Mothers Day Classic – 2014! You can never go wrong with Spag Bol!